Mary Ward was a Catholic nun, born in the 16th century (1585-1645), to a wealthy Catholic family near Ripon in Yorkshire. She received a good classical education and then at the age of 15, she entered the monastery of Poor Clares in St Omer. By 1609, she had gathered a group of companions around her who were determined to follow her guidance in founding a religious Order for women along the lines of the Society of Jesus, which became known as the Institute of the Blessed Virgin Mary, better known as the Sisters of Loreto, which have established almost 200 schools around the world. 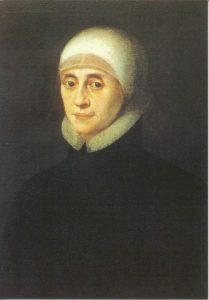 Mary Ward believed that women were intellectually equal to men, and deserved an education that reflected that equality. The education of girls remained central to her work and she spent twenty years travelling widely, often on foot, founding schools across Europe. In 1639, she returned to England, founding several free schools in London, before settling in Heworth, near York, where she founded a convent. She died at St Mary’s School in York in 1645. St Mary’s has its roots in the life of Mary Ward. Her vision, “Women in time to come will do much,” inspires our girls to aim high and do much – and to become confident, compassionate young women who play a positive role in society. Each year, around her birthday, we celebrate her life with Mary Ward day, a long-standing traditional day of celebration and reflection at the school. It involves a dress-up theme, games and lots of fun activities around the school campus, culminating in the much-loved staff pantomime. Mary Ward scholarships are awarded at 9+, 11+, 13+ and 16+ to girls who will contribute to the school as a whole through their abilities in more than one area. Girls are expected to live by the Mary Ward ethos which is at the very heart of the school.